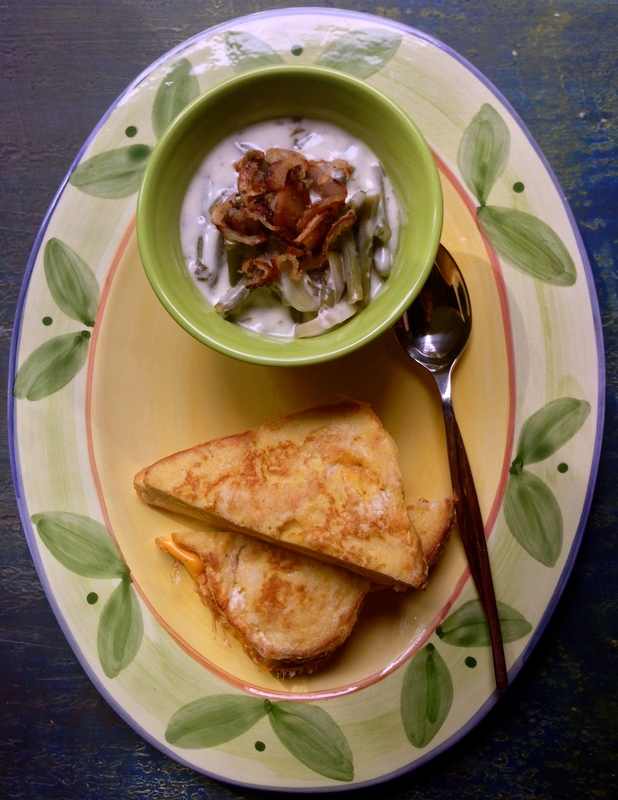 Make the crispy onions: Toss onion with flour, breadcrumbs, salt and pepper. Heat a 1/2-inch or so of oil in a 12-inch cast iron skillet until a drop of water flicked into it will hiss and sputter. Add onions, just a handful at a time in something close to a single layer, and fry until a light golden brown (they’ll get more color in the oven; I overcooked mine a bit, forgetting this). Remove with a spider or large slotted spoon, let oil drip off a little, back into the skillet, then spread onions out on paper towels to drain. Repeat with remaining onions. Set aside until needed; this makes a lot. • Remove the bean ends and pull off the tough stringy bit from the sides. • Rinse beans under cold running water. • Chop into 1-1/2 inch lengths. • Add water to the level of the beans and salt it. • Bring it to boil, reduce to simmer and place a lid on the pot. • Cook beans until tender. • Meanwhile make the roux. • Melt the oil in a non stick fry pan. • Add the onions and the garlic and sauté until very soft. • Stir in the flour and cook until flour is a golden color. • Add cold water and stir smooth. • When the beans are cooked, stir in the roux. 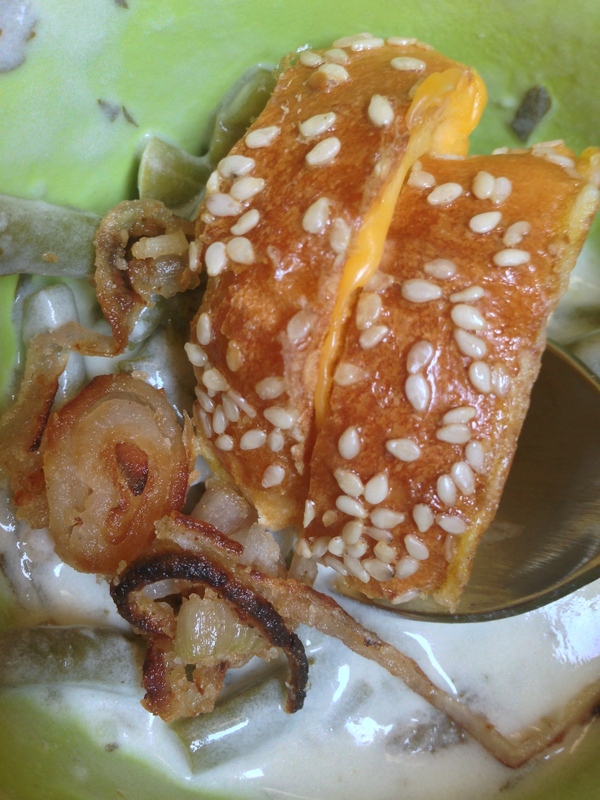 • Bring it to simmer and then add 1/2 cup of sour cream. • Adjust the salt and add the ground pepper. • Remove pot from heat and set aside. 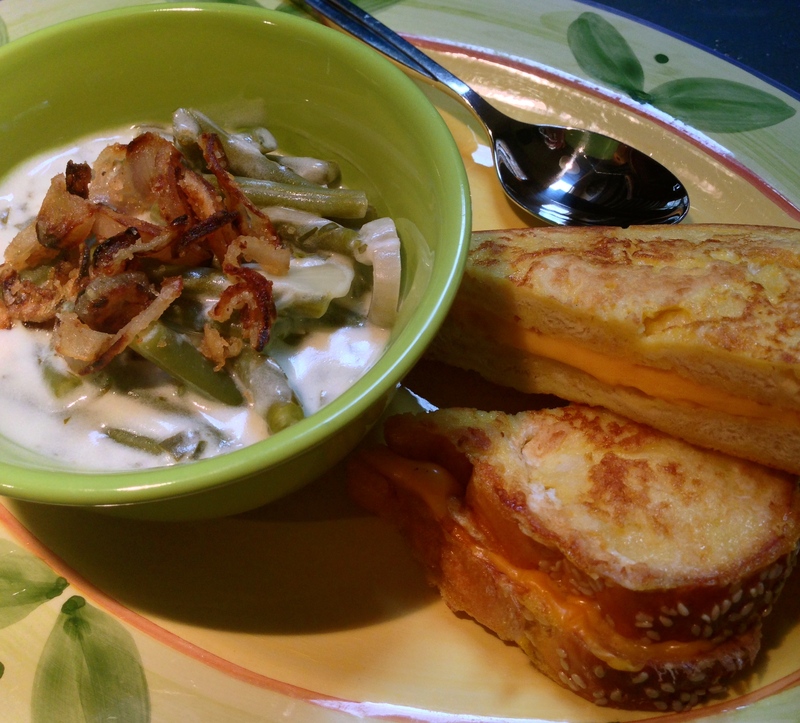 • Serve the bean casserole with crispy onion and french toast with grilled cheese.